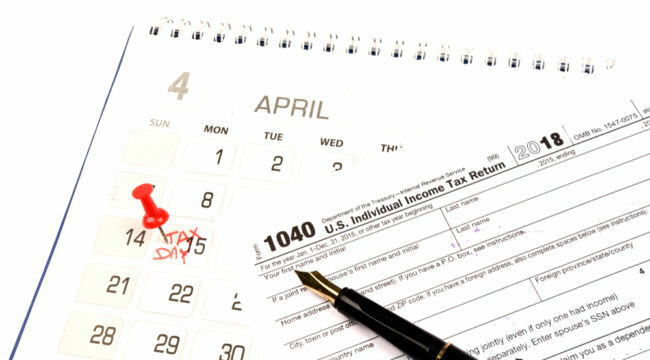 It is the ides of April… April 15… Tax Day. That is, the date by which Americans must appear before the Internal Revenue Service… and empty their pockets. Out must come poker winnings, bingo jackpots, lemonade stand sales, cash gratuities — everything, A through Z. If taxes are the price to pay for civilization — as Justice O. W. Holmes babbled in 1904 — we must conclude the United States is a very high and advanced civilization. Washington hauls aboard some $3.5 trillion in tax revenue each year. And the United States tax code bulges to over 7 million words… or several times the size of King James’ Bible. We discover the average American sweats and huffs nearly four months of the 12 to work off all federal, state and local taxes. This year’s “Tax Freedom Day” falls tomorrow — April 16. A medieval serf, incidentally, was generally tapped 10%. “One day’s labor in 10” was the prevailing principle. Today’s American must slave nearly four days in 10… yet he declares himself the freest bird in the history of the world. Between 1764 and 1775, American Colonial taxation ran to some 1% of total income — 1%. Might we renounce United States citizenship, with all the benefits, glories and vanities obtaining therefrom — in exchange for 1% taxes? The temptation would be vast, it cannot be denied. What if we want the kind of society that minds its own business — and keeps its hands out of our pockets? But Mr. Summers did not consult us. Before the conclusion of the fiscal year, for example, were you aware that the United States Air Force parks planes on tarmacs and run the engines to burn fuel? If it does not deplete last year’s ration, goes the thinking, it cannot requisition additional fuel for the next. And so it strikes a match to existing supplies as the fiscal year draws close. A trifling example of waste, yes. But can you think of a private airline operating with such opulence? $998,798 to ship two $0.19 washers from South Carolina to Texas… $350,000 to sponsor a NASCAR driver… $200,000 to rid Californians of tattoos no longer desired… $500,000 to paint the image of a salmon on an Alaska Airlines jetliner. Shall we mention the $3 billion spent to plop sand upon the nation’s beaches, so it can simply wash away into the ocean… or the $60 billion in fraudulent health care claims? We could continue — but mercy forbids it. Meantime, deficits mount with each passing day, month and year. The federal government ladled out $401 billion in February, for example. Yet it only took aboard $167 billion. This year’s deficit is projected to exceed $1 trillion — up from $585 billion as recently as 2016. And trillion-dollar deficits loom from horizon to horizon. The Trump tax cuts are at least partially responsible for the shortfall. If increased economic activity from tax cuts is to make the shortage good… the famous Laffer curve is in for heavy duty ahead. The Congressional Budget Office (CBO) estimates the tax cuts added roughly 0.3 percentage points to 2018 GDP. We are heart and soul for tax cuts — deep, gashing cuts that penetrate to the bone — and even beyond. But let us harbor no delusions. And without spending cuts to match, tax cuts simply add to the swelling deficits… and the national debt. That national debt presently rises above $22 trillion. What are the greatest burglars of America’s fiscal future? Social Security, Medicare and Medicaid… with interest on the debt into the bargain. These black holes alone could devour some 78% of the federal budget by 2026. According to an authority no less than the United States Treasury… projected taxes to fund Social Security and Medicare over the next 75 years fall $46.7 trillion short. “Unfunded liabilities” is the term. Economist and Boston University professor Larry Kotlikoff insists Social Security, Medicare and Medicaid aren’t fully accounted for in official crunching. Accounting shell games mask the entire business, says Kotlikoff. Give a true accounting and what is America’s true debt? Over the next 75 years, this glum Gus projects America’s true debt at a cosmic $211 trillion. If you add up all the promises that have been made for spending obligations, including defense expenditures, and you subtract all the taxes that we expect to collect, the difference is $211 trillion. That’s the fiscal gap. That’s our true indebtedness. Here we approach a twilit neverland in which numbers become meaningless. Either a 53% immediate and permanent hike in all federal taxes or an immediate and permanent 33% cut in all federal expenditures. May we call upon you for a favor? Please rouse us when the American people agree to a 53% tax hike… or an immediate and permanent 33% spending cut. In the spirit of fairness, we concede that Kotlikoff’s nightmare numbers are not universally accepted. Some claim he does the scene in wildly exaggerated colors. Perhaps he does… perhaps he does not. How Much More Civilization Can America Take? When Holmes claimed taxes are the price we pay for civilization, the average American tax rate was 3.5%. Even in light of the tax cuts, today’s average American worker’s contribution to civilization runs to perhaps 32%. And higher taxes will be required to keep up in the years ahead. But how much more civilization can America take? How does a civilization survive… if it must tax itself to death?